Bandera Grassland - How we raise our beef. We follow the American Grassfed Association standards from birth to harvest. Our beef finishing practices regenerate our soils by converting solar energy harvested through the photosynthetic process into energy usable for animal growth. The mineral cycle from animal waste to soil microbial food, feeds forage regrowth and aids decay of oxidized organic matter, sequestering CO2 in the soils. Adaptive multi-paddock high intensity, low frequency grazing benefits ground water retention and flora and fauna community dynamics. Complexity of flavor and marbling are products of maturity. Our cattle run in family groups as long as possible. Calves are weaned after 8 months of age according to the condition of the mother and available forage. Animal welfare is our primary concern. Our beef cattle graze open pastures and are allowed to grow at their own, natural, rate with no antibiotics or growth hormones administered. Grass feeding and finishing cattle is an art form, using the soil, season and plant life to produce truly artisan beef. Different forages mature at various times of year. Grass farmers and graziers must learn which forages perform best in his/her soil types and climate and what must be planted seasonally so the animals always have a fresh supply of lush green forage. Beef grazed on grass takes on subtle characteristics of the forage consumed. 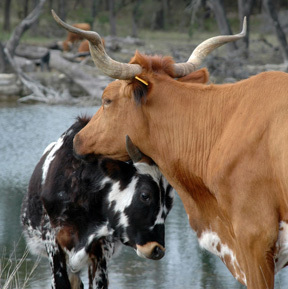 Graziers must identify which forages are sweet and produce sweetly flavored beef and which bitter forages to avoid. The result? Healthy, wholesome, more flavorful beef, grown on our family owned earth-friendly farms.